Rosh Hashanah: Is The Feast Of Trumpets A Dress Rehearsal For Future Events? Did you know that all of the festivals in the Bible were designed to be dress rehearsals for future events? The Hebrew word “moed” is commonly translated “feast” or “festival” in the Bible, but it really means “appointment”. God has set a number of “divine appointments” with Him on the yearly calendar, but even though most Jews still celebrate these days they don’t know what they actually mean, and most Christians stopped keeping them long ago. Whenever one of these divine appointments arrives, we are supposed to look back and remember something that God has done in the past, but we are also supposed to look forward to what He will do in the future. 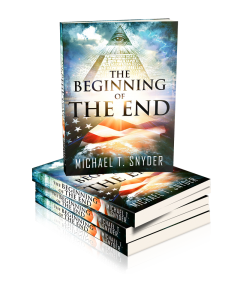 In fact, in these festivals God has essentially given us a “road map” of the most important events in human history. On Rosh Hashanah (also known as Yom Teruah and “the Feast of Trumpets”), we remember “the birthday of the world”, but we also look forward to the Biblical events that will take place on the day when the last trumpet will blow. Rosh Hashanah is a holiday that was created by God (see Leviticus 23), it is a holiday that Jesus celebrated, it is a holiday that the first Christians celebrated, it is a holiday that foreshadows the return of Jesus for His bride, and it is a holiday that the entire planet will celebrate during the 1000 year reign of Jesus on earth. Sadly, most Christians don’t know anything about this amazing festival even though it is featured very prominently in the Scriptures. But it is very important for believers to learn about these festivals, because God didn’t just create them for us to have a good time. All of the festivals are about Jesus, and all of them are highly prophetic. This is something that makes the Bible truly unique. We have a God that has already told us how history will unfold in advance. And one of the ways that God does this is through the festivals that He has created for us. The Hebrew word is “Moed” and means an Appointment. Divine Appointments of God intersecting History to accomplish His will. They were called Holy “Convocations” which in the Hebrew is “Miqura” which means an “assembly” but also implies a “Dress Rehearsal”. Is the Lord the same Yesterday, Today & Forever? Do you believe in Divine Appointments? We need to realize the Lord fulfilled the Spring Feasts not only to the day but to the very hour. Dying as the Passover Lamb on the Feast of Passover, not on the day before nor on the day after. He was crucified at the time of the morning sacrifice, died at the time of the evening sacrifice. In the grave on the Feast of Unleavened Bread, and rose on the Feast of First Fruits. First Fruits was a Feast the Jews had been celebrating for over 1,000 years before Christ ever rose! It was on the very day of the Feast of Pentecost that The Holy Spirit was poured out. Pentecost had been celebrated for over 1,000 years before the book of Acts was even written. The Jews were required by God to keep the Feast of First Fruits and the Feast of Pentecost back when the Torah was written by Moses! During the original Passover celebration just before the people of Israel left Egypt, God instructed His people to kill a lamb and to put the blood of that lamb on their doorposts so that the death angel would pass over their homes. Well, even today most doorposts are made of wood. And where does wood come from? So the message of the original Passover was that the blood of the lamb on the tree delivered them from the wrath of God. After the people of Israel entered the Promised Land, God required His people to gather at Jerusalem on that same day every single year in order to celebrate the Passover. Looking back, we can now see that God had His people gather together every single year in the exact city where Jesus would die on the exact day when Jesus would die and He had them act out rituals which precisely foreshadowed the shedding of the blood of the Lamb on the tree (the death of Jesus on the cross). Even though this was done every single year for 1000 years in advance, most people still missed it. And just as Jesus fulfilled the Spring feasts during His first coming, He will also fulfill the Fall feasts during His second coming. Every year we celebrate “a memorial of blowing of trumpets” to foreshadow the day when the last trumpet will blow and we will be called home. All of God’s festivals are about remembering something and about looking forward to something. Christians and Jews have traditionally believed that the Feast of Trumpets is “the birthday of the world”. Isn’t that something for all of us to celebrate? All of God’s festivals always point to Jesus. It is traditionally believed that it was on this day that Abraham nearly sacrificed his son Isaac before God intervened and provided a ram instead. Abraham did not know it at the time, but his actions were precisely foreshadowing the time in the future when God would give His Son as a sacrifice for the sins of all humanity. The parallels between the two stories are absolutely amazing. In fact, the events that happened on the mountain in Genesis 22 occurred on the exact same mountain that Jesus would die on approximately 2000 years later. For centuries, Genesis 22 has traditionally been read as a part of Rosh Hashanah celebrations. 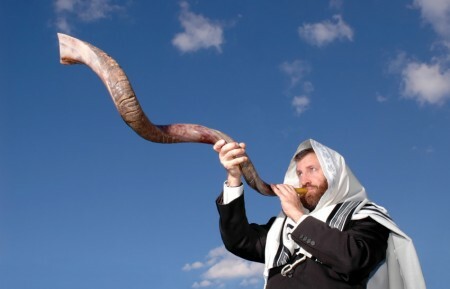 A shofar is actually a ram’s horn, and so the fact that the shofar plays such a key role on the Feast of Trumpets also links the events of Genesis 22 to this day. We remember when God provided a ram for Abraham, and we also remember when God provided His Son to pay for the sins of all mankind. The Scriptures tell us that Jesus was without sin. He perfectly obeyed the entire Torah, and that included keeping the Feast of Trumpets and all of God’s festival days. None of the holidays that Christians celebrate today had even been invented when the first Christians were running around in the first century. Instead, they celebrated the holidays that God invented and that had always been celebrated by believers. If you go through the book of Acts, you will find many examples of this. In fact, on the very first festival day after Jesus rose from the dead (Pentecost), God poured out His Holy Spirit on the early disciples. It was almost as if God was confirming that His festivals were still going to be important even after the time of Jesus. Jesus was almost certainly born during the Feast of Tabernacles. Jesus was crucified on Passover while the Passover lambs were being slaughtered. Jesus rose from the dead on First Fruits. As noted above, the Holy Spirit was poured out on the early apostles during the Feast of Pentecost. God always does the “big things” on His festival days, so why not celebrate them and be looking forward to what God is going to do next? In Revelation 12:17 and Revelation 14:12 we read that the remnant of the last days will have both the testimony of Jesus and will keep the commandments of God. Already, Christians all over the world are awakening to God’s commandments (including keeping the festivals) and we will see a further revival of these things in the years ahead. I had been a Christian for more than twenty years before I ever learned anything about these festivals even though they are featured very, very prominently in the Bible. Fortunately, there has been a worldwide awakening to their importance in recent years. Today, they are being talked about in churches, in books, on radio shows, on television shows and on the Internet all over the planet. God is moving, and this is only just the beginning.